Here is another to let you know that Im still O.K. and back with the company again. Left the hospital yesterday and feel a great deal more at home than I did while away which was just a week. We just got back form the Y.M.C.A. Hut where the band gave a concert and six pictures were shown. It was a very good show, for us and every one enjoyed every minute of it. Winter is here in earnest now and if you was here tonight you would agree with me. It snowed the night before last, was cold all day yesterday and today, and now, there is a strong wind blowing, with snow and rain to make it more dismal. There is a very good fire going here though and I am very comfortable. There are four of us at this table now writing letters which shows that we are all in about the same mood this stormy night. We have been stationed in this little town (which is about thirty miles from Neufchateau, or where we were stationed last winter at this time) for over a month and it is getting to be like home to us. I suppose we will stay here until we leave for home, which will please me alright for I don’t fancy moving in this kind of weather. The papers must have given an account of the President’s visit to this area and it sure was a buisy day for all conserned. Say Em a nice blazing fire in a large fire place (for this is all you find in these small towns) sure does make you feel comfortable don’t it? Can you picture us these cold dreary nights all sitting around this fire place (there are sometimes as many as ten in the circle) talking of home and past experiences, or telling stories to keep things interesting, every eye on the blazing logs as if they would disappear if we did otherwise. Yes we squat around this fire as if it was life itself and kill these last (and I hope few) nights in battle torn France. Im up to my old tricks again now. While at the front we were lucky to get a wash once a week, but today (and it can continue) I washed a suit of underwear, O.D. shirt, pair of stockings, half dozen nose cloths and a towel. Pretty soft though. Throw them into a pail, boil them over this fire, and a peace of soap and brush does the trick. It is eleven oclock now so I guess Ill close this letter, worm into a place at the fire for a few minutes for a shin roast before I roll in. 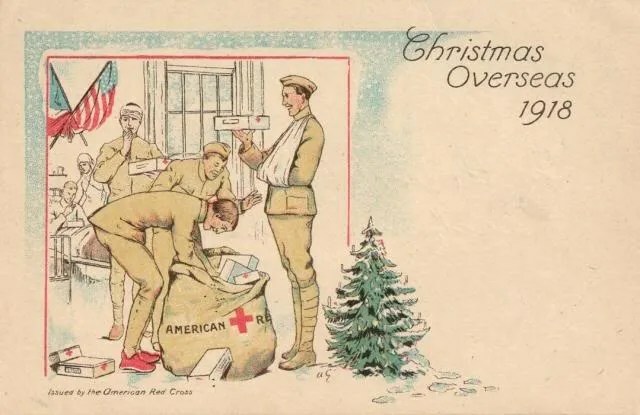 "In the Red Cross Bag that each man received." Yes it is Christmas Day and Ive just got through eating a real Christmas Dinner. While the boys are talking singing and making the day as pleasant as possible I thought Id spend a few minutes back home there with you in this way if I cant be present. It is a very pleasant day here, although the sun is not shining and it is pretty chilly. I say pleasant for I consider it such as long as it does not rain. Up until this morning it has rained steady for over a week and I don’t remember how long it has been since I saw the sun for a longer period than one hour. I can truthfully say that I am enjoying this Christmas very much considering the fact that it is the second one spent in France and that I expected it would be spent at home as much as a month ago. Yesterday three other fellows and myself went to town and here is how the Eve was spent. First I bought some very pretty pillow cases as presents for you and Lena. I don’t know whether to take a chance and send them home or take them with me when I go, for there has been a lot of stuff sent home by the boys that never reached there. You will like them I know when you see them. Anyway, after getting said souviners we had a beefsteak and French fried potatoes feed with what goes with it of coarse. Tried to have my picture taken but learned that they wouldn’t be ready for at least ten days, and as we expect to leave shortly I gave up this idea. It was raining very hard and to get out of the rain we went into one of those places where you sit down and call for more. Must say that we enjoyed ourselves until closing time which is eight oclock and then started home. Everybody was happy (or appeared to be so), but it was that make the best of it spirit that was very much in evidence. On getting back we found that the Red Cross had left each one a bag containing hankercheif, cigarettes, candy, nuts, stockings etc. The Y.M.C.A. left a box containing tobacco, cigarettes, candy, cookies etc. 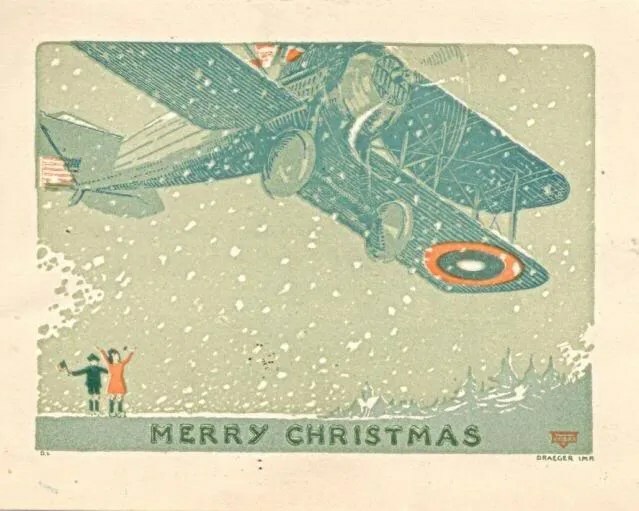 It was late before we turned in and the climax of my time came when one of the boys who went over to where the company is, came in and handed me the Christmas cards from you and Lena, Bert and dear old Dad. Also your letter of Nov. 26th. They could not have been received at a more opertune time. Of coarse they made me feel all the more thoughtful of home and you folks, and right there I promised that I would give over these few minutes by writing a letter today. This morning a few of us took a walk which produced quite an appetite, and on returning which was none too soon this is what we sat down to. Turkey, mashed potatoes, peas and gravy, fruit perserves apple pie and cheese, salad, bread and butter and cocoa. Some dinner beleive me and I sure did do my duty. Ive got the pipe steaming good now, a good place to write and tell you about it which makes this old Christmas far from a tough one, for me. Im wondering now if you folks are enjoying yourselves. Your letter of Nov. 26 assures me and right here I will answer it. The clipping about Granmie was very interesting to me and it was appreciated. Ninety three is a good old age and if I knew her address (it does not say in the clipping) Id send her a few lines. I think Ill write any way and address it N. Manchester. Glad to hear that the furnace is going and that everything is O.K. As for our General Edwards. He is liked by every man in the division and we all know that he will do what he can for us. Im glad that the crisis is over and that Madge and the rest are well. Im still here at Base 88 only waiting to be sent to the company. Feeling great. The President is due in this visinity some time this afternoon and he is to give the 26th the once over. Forgot to say that with you letters and Christmas Cards there was a box of tobacco and this pipe I am smoking. The outside wrapper was not on it nor anything to let me know from who or whence it came. I wish I knew so that I could write and acknowlege it but you see Im out of luck. 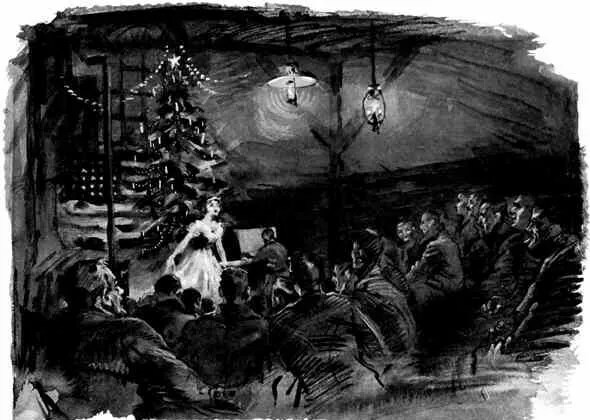 Well Em and the rest, by this letter you will see that this second Christmas in France is being spent a great deal better than it might be. Far from what it would be if the war was still on. It is a very Happy Christmas for me and I hope that it is with you. Ive said very little about the war for at that time the censor was rigid but when I get home (which is soon now I think) I will have a lot to say. Before saying anything I first want your forgiveness for my not writing while on my furlough. Im not sure whether I will get it or not (your forgiveness I mean). I had a wonderful time and after waiting for fifteen long months for it will have to admit that the seven short days were given over to nothing but enjoyment. Don’t think that I absolutly forgot you, the folks and home for that is one thing I did remember many times, which I think was more essential than just writing. I think I told you before I left for this furlough that I had to my credit six months pay and 15 months reinlistment money. Some how or other I didn’t receive a cent of this nor have I yet. Had I got this I would have sent some wonderful presents that I saw at this resort. I got by though through the good fellowship of the other boys with what I borrowed. There was something doing every minute. 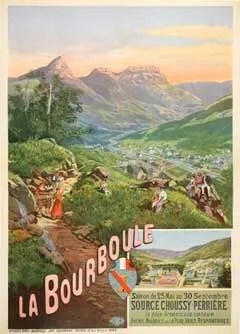 The trip itself was worth going for and the beauty of La Bourboule will never be forgotten by me. About 30 miles from our stopping place the train was split into two sections for the climb up through the mountains was very steep. Well Em it will have to be a better man than I am to explain these French Alps if they are to be given anywhere near the credit that is due them. As our section left the city of Clearmont (which is a very large place and the starting place of about all tourists to different places in the mountains) we could see the great peaks ahead rising up in our way but never hindering the progress of the little puffing engine that seemed to worm its way picking the gentlest grades but yet climbing as every foot went by. It was just before the sun was setting that we were surrounded with the grandest scenery that I ever did and I guess ever will gaze at. Yes Ill say surrounded, for Em no matter where one looked a feeling would get ahold of them and hold them spell bound. You’ve read of the towns nestled in the Alps, and they are not only nestled there but sleeping peacefully as though the peaks and the snow that caps these peaks were trusty watch men. Looking out of the train window, away down there where it seems you could hit the little church steeple (if you were a German) with a stone, sleeps a town. Pretty little towns too. All of a sudden the train is but a toy for on looking from both sides of the car window nothing but mountains confront your view. 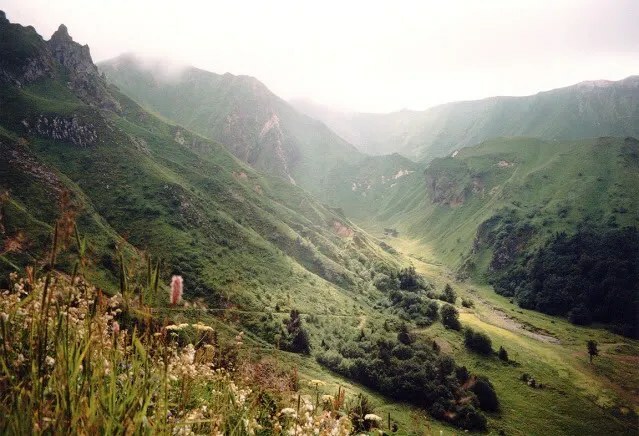 The little train keeps puffing though, enters a tunnel through one of the mountains, comes out on the other side where lies on one side a valley at least ten miles wide and on the other a mountain it seems as high. Rest well assured Em I did enjoy the trip and now I suppose I should discribe my stay at one of the most expensive tourists resorts in France. When one speaks of La Bourboule (and I suppose the rest of these places are the same) it is a city of hotels that is meant and a lot of places of amusment. This town (Ill call it town) sets up in the mountains, and while in it you would think you was at any one of our own summer resorts mostly Nantasket. Looming up on all sides are hills and the only reason I call them hills is because beyond these are still higher hills, but they are all mountains. A view from any window in any hotel (and there are many) is as good a picture as any one would care to look at. I wish I could have taken a picture of this place from a point from which I happened to see it. Say it was a picture. Now I will tell you how I enjoyed myself. Mind, we were sent there as are all men on furlough, train fair, meals, and board, paid by the Government. We are put up at the best hotels and enjoy first class eats. The Y.M.C.A. has a building (The Palace) in which there is reading, writing, dance hall and canteen rooms, besides a grand theatre. Some thing doing at the Y. every afternoon and evening such as Stunt Night, games, good shows by French actors, fights, restling, and dancing. I was there twice when there was dancing and the Y girls were there beleive me. They are a lively bunch. When I wasn’t at the Y I was having a fine time also, which I don’t imagine is much news to you. I had a good time anyway so Ill can telling you any more about this 7 days leave and answer your letters which were handed to me on my arrival back to the company. Your birthday cards and Lena’s too were both received yesterday and they were great. There is a lot of talk of our going home soon now, but talk and hopes aint going to get us there so I take no stock in what the papers say. That little kitten must have had a tough time of it and as I read your letter I could not for the life of me dope out what I was coming to or what became of the cat. I finally came to the place where it acted the goat and was glad when the assurance came that it was O.K. When you speak of the cat coughing I might as well tell you that Ive got one of these again myself. I got quite a cold just before leaving La Bourboule and the trip on the train didn’t help it any. When I arrived at the company and on being examined by the doctor three words from my lips was enough to convince him that I got cold and away to the hospital I went. I will be back with the company again soon though. The flue is here now and they are acting very careful. My throat is coming along fine now and Im alright so don’t worry. If Lena will remember I had the same kind of trouble with my throat the time I came back from Washington, and now you’ve got the story. These after war diseases you speak of are never getting me Em so don’t worry on that score. I spend too much time having a good time in my own silly way to get mixed up into anything like that. While away on furlough I just simply raised the devil and smoked a lot of cigarettes, stayed out late nights and sang a lot of songs. Result – a very hoarse throat and a little cough. Im a great deal better off at that than a lot of so called wise guys that are not as noisy as I am when on a good time nor as brave when there is no one around to see them perform. Don’t worry about me Em. Ive come through so far and when the 26th goes home Im with it. Give my regards to all and tell them that I will write as soon and as much as I can. I am at Base Hospital #88 Langres France. Don’t address my mail here though for I will soon be back with the company as soon as they are sure I have not got the flue, and that very soon. Will send some souviners as soon as I get some jack. S. E. Avery #69762, Hdq Co. 103rd Inf. A.E.F. I have just been granted a furlough and although we don’t know just when we are to leave, our time dosen’t start until we arrive at the leave area so we should worry. 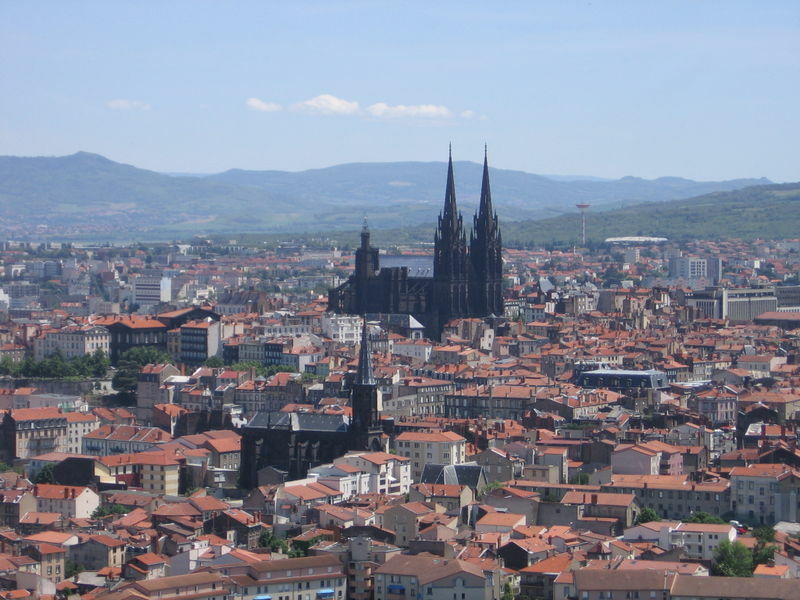 The place to which we are going is La Bombole some where in the south western part of France and over a hundred miles from where we are now stationed. From what the fellows say that have been there I judge that one can have a very good time. Im looking forward to it anyway and you can rest assured that after a fellow has spent over ten months in confinement and the greater part of this time right at the front he will enjoy himself when given a little liberty. They say there are all kind of amusments, and plenty of eats of the best kind. Picture me will you, for seven whole days where there is all kinds of dancings and other places for the boys. Y.M.C.A. girls to dance with. I am feeling tip top and can’t see why I won’t enjoy myself perfectly. Will write again when I arrive there and tell you what kind of a time I am having. Hope that Henry is coming along alright, and tell Lena to watch herself in the health line. 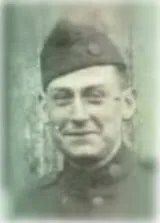 S. E. Avery #69762, Hdq Co. 103rd Inf.